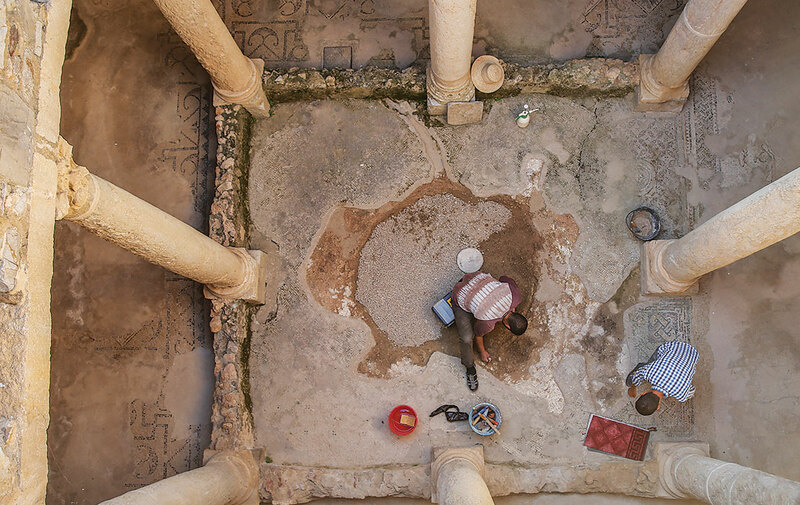 Mosaic conservation technicians from the Institut National du Patrimoine stabilizing and completing a large lacuna fill in the underground level mosaic of the Maison de la Chasse at Bulla Regia in Tunisia. Photo: Christopher Sprinkle, Getty Trust. In May at the Roman and Byzantine site of Bulla Regia in Tunisia, the GCI resumed its field activities to conserve one of the most significant houses of the period, the Maison de la Chasse, after recent campaigns were interrupted or postponed because of security concerns. Together with technicians and workers from the Institut National du Patrimoine, the Institute is conserving and presenting to the public this entire building using methods that demonstrate best practices and long-term sustainability. During this campaign, improvements to drainage in different rooms were carried out, and pavement areas previously covered with cement were provided with new lime mortar layers after careful removal of the cement. Different methods are being tested and employed for allowing visitors to explore and circulate through the house without walking on the ancient mosaic pavements, with the aim of reducing damage such visitation can cause to the fragile remains. Conservation planning for the hundreds of mosaics is continuing, as is implementation of emergency mosaic conservation measures across the site. Heavy winter rains had caused on-site springs to overflow, which led to flooding of the underground floor of one of the most important excavated houses, the Maison d’Amphitrite. With the assistance of pumps, the springwater eventually receded, and the GCI team was able to inspect the underground rooms and the condition of the mosaics and wall plasters. Though the immediate flood damage was minimal, continued water ingress will accelerate deterioration processes, including the oxidation of iron rebar of reinforced concrete support panels of the house’s significant figurative mosaics. The GCI team is recommending that hydrology experts survey the site and determine the best water management approach to prevent future flooding of the buildings.